To some, an unknown entity, Military Ballistics Industries is a remanufacturing operation that takes fired brass and remakes ammunition out of it. They are essentially a factory that is sanctioned for reloading. They offer good prices for quality components and they have a very good reputation among users of the product. These rounds are .380 ACP/Auto and are loaded in once fired brass cases. 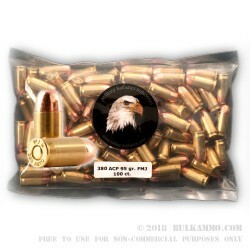 This is a bulk case lot of 1000 rounds and features a load that has a 95 grain full metal jacket projectile and comes sealed in 10 bags of 100 rounds. When it comes to cheap 380 acp ammo – this is tough to beat! The company has a good following in the shooting market among shooters who like to shoot remanufactured ammunition to save some money. The performance and quality is on par with most brass cased imports at the lower end of the spectrum and the production occurs here in the USA. Sometimes price is not the only reason to make a purchase and purchasing from MBI will keep some Jobs here is America and increase the company’s capacity to grow and produce new SKU’s. That said, you will have to weigh the following information before purchasing: Are you comfortable shooting remanufactured ammunition. If you are, these are fine rounds. 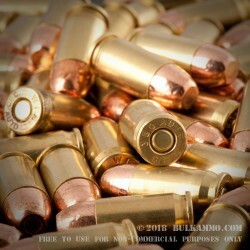 MBI has strict standards; BulkAmmo has strict standards there is an abundance of due diligence and experience behind this choice to offer the ammunition for sale.